Tropical Depression 04F may intensify into a Tropical Cyclone in the next 3 to 6 hours. The Fiji Meteorological Services says TD04F is moving southeast at about 30km/hr. 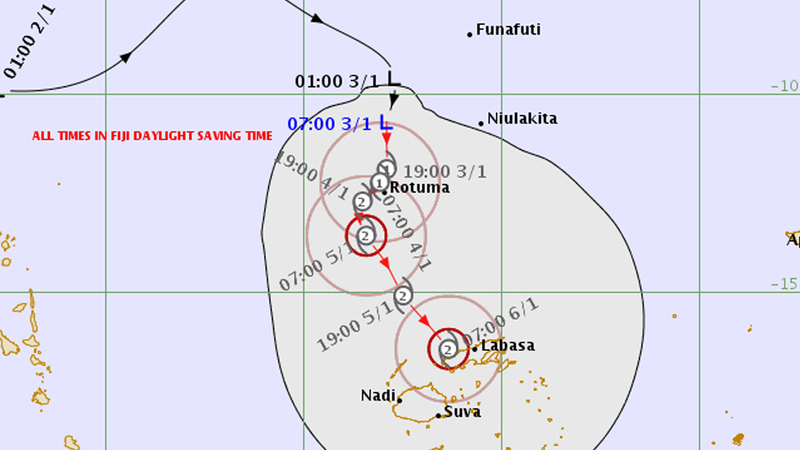 TD04F was located about 220km north of Rotuma at 5am today. A gale warning is now in force for Rotuma. On the anticipated development and track, the system may bring damaging gale force winds over Rotuma in the next 12 to 18 hours and over Vanua Levu, Taveuni and nearby smaller islands, Lau and Lomaiviti group in the next 24 to 48 hours. On this track, the system is expected to be located about 120 km east-southeast of Rotuma or about 430 km north-northwest of Labasa at 5pm today. Meanwhile, flood warning remains in force for all low lying areas, small streams and areas adjacent to major rivers of Vanua Levu.